Ōgon Musōkyoku (黄金夢想曲?, lit. Golden Fantasia) is a 2D versus fighting game developed and published by 07th Expansion. 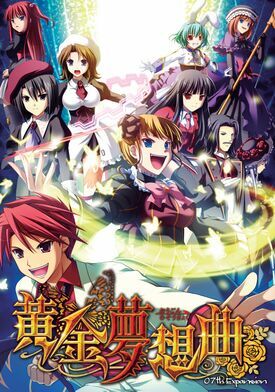 It is considered a spin-off of Umineko no Naku Koro ni and was originally released at Comiket 79 on December 31, 2010. The game was later ported to the Xbox 360 by Alchemist on October 6, 2011 under the title Ōgon Musōkyoku X. An append disc to the original game titled Ōgon Musōkyoku Cross was released at Comiket 81 on December 31, 2011. The game was adapted into a manga illustrated by Morozumi Junka and serialized in Kadokawa Shoten's Comp Ace magazine in December 2011. Ōgon Musōkyoku is a fighting game that can be played by up to two players. Gameplay revolves around a tag-team battle system in which each player takes control of two characters, only one of which can be controlled at a time, but both of which can be switched out with the other through the game's "Touch" system. A "touch" can only be performed when a player's Touch Gauge is full (the gauge fills on its own over a set period of time). There are five kinds of touching methods, each of which uses up a different amount of the Touch Gauge: Normal Touch, which is used when the player isn't performing any other action; Attack Touch, which is performed when the player is in the middle of attacking an opponent; Guard Touch, for when the player is guarding against an opponent; Damage Touch, which can only be used when the player is damaged, and has the additional effect of creating a barrier that forces the opponent away from the player; and Assault Touch, in which the player performs a rushing attack towards an opponent before switching out. Every character in the game has a unique ability which can be used to improve their own skills or their partners' skills for a limited period of time. There are two methods of activating abilities. The first method is through touching, which automatically activates the ability of the character being switched out and affects the character being switched in. The other method is by summoning the Metaworld, which not only drastically changes the background, but also activates the abilities of both the player character and his or her partner at the same time. The Metaworld can be summoned through use of the SP Gauge, which also allows characters to perform special, powerful attacks called "SP Supers" and "Meta Supers". However, two players cannot summon the Metaworld at the same time; the first player to summon the Metaworld will benefit from its effects, but it is possible for the other player to cancel out the opponent's Metaworld. The Metaworld will remain active until the summoner's Meta Gauge runs out. The game is set on the island of Rokkenjima, where a series of mysterious deaths and disappearances take place over the course of October 4 and 5, 1986. The story focuses on a game of twisted logic between Beatrice, a legendary witch who claims she used magic to perform the murders, and Battler Ushiromiya, a young man who argues that the murders could be carried out by ordinary humans. As a tag-team game, the game's story mode follows multiple pairs of characters, each of which has their own story and ending that take place in an alternate continuity from Umineko no Naku Koro ni. Battler is a versatile and well-rounded character who excels at close to mid-range melee combat, and has a number of powerful SP Super and Meta Super attacks. His ability, "Resurrection", gradually restores the player character's health over time. Beatrice excels in various magical attacks, and has an arsenal of powerful SP Supers. Her ability, "Infinity SP", allows the player to perform one Super attack without using SP. Ange can close the distance between her and her opponent by summoning Sakutarō and the Seven Sisters of Purgatory, who can attack freely from her. Her ability, "Stun Boost", increases the chance of the player's attacks stunning an opponent, making the opponent susceptible to more attacks. Lucifer excels at performing attacks after the player switches her in using an Attack Touch. Her ability, "Attack Touch", allows the player to perform a single Attack Touch even if the player's Touch Gauge isn't full. Shannon has a defense-oriented fighting style that allows her to widen the distance between her and her opponent by creating barriers, which can nullify enemy attacks. Her ability, "Auto-Guard", allows the player to automatically block an opponent's attacks. Kanon is a fast melee character who possesses an array of swift attacks that can quickly be strung together into combos. His ability, "Silent Attack", decreases the amount of SP the opponent gains while they are being attacked. Virgilia possesses a wide array of magical attacks and weapons designed to damage opponents regardless of her position in the arena. Her ability, "Brimful", gradually fills both player characters' SP Gauge over time. Ronove, similar to Shannon, is a defense-oriented fighter who specializes in blocking and parrying his opponents' attacks. His ability, "Counter Boost", increases the damage dealt by the player's counters. Eva Beatrice is a melee fighter who specializes in close-range fighting and grappling. Her ability, "Berserk", increases damage dealt by 50%. Chiester410 is a ranged fighter whose attacks can travel anywhere across the arena. Her ability, "Break Boost", increases the rate the opponent's Break Limit gauge will fill. The Break Limit gauge only fills when a player is blocking an attack; once completely filled, the target will suffer from a Guard Break, which leaves them open for attack. Jessica is an additional character available in the Xbox 360 port, and is included with an expansion patch for the original game. She is a close-range melee fighter who can enhance her attacks to deal additional damage. Her ability, "Shave Boost", increase the chip damage dealt. George is first introduced as a playable character in the Xbox 360 port. He specializes in performing high and low-range attacks to knock down his opponents. His ability, "Patience", causes the player's SP Gauge to fill while blocking attacks. Rosa is another character introduced in the Xbox 360 port who is added to Cross. She is able to perform mid-ranged attacks with her weapon, a short-barreled rifle, which can also penetrate the defenses of the player's opponent. Her ability, "Detachment", allows the player to force a waiting state on the opponent's touch gauge, temporarily preventing the opponent from switching characters. Erika is introduced as an additional character in Cross. She is more mobile than other characters, and is capable of performing secondary midair jumps. Her ability, "Force Counter", turns every attacks into a counter hit. Dlanor is introduced as an additional character in Cross. She specializes in grappling opponents, and can summon her subordinates Gertrude and Cornelia to provide defensive support. Her ability, "Armor Boost", halves the damage received. Black Battler is an additional character introduced in Cross, and is based on an extra tip written by Ryukishi07 outside of the main Umineko story. Black Battler is, much like his counterpart, an all-rounded character in term of close and mid-range, with few changes of properties in some attacks, as well as his HP. His ability, "Massacre", allows the player to absorb HP while damaging their opponent. Willard was included as part of an expansion for Cross released on February 24, 2012. Willard mainly specializes in long-ranged melee attacks with his katana. His ability, "SP Cancel", allows the player to cancel one special attack into an SP or meta super. Lambdadelta was included as part of an expansion for Cross released on March 23, 2012. Her moves mainly involve hurling candy and food at her opponents at a long range and she can also create a magical shield to defend herself from projectiles. Her ability, "UltraPER", instantly resets the player's break gauge. Bernkastel was included as part of an expansion for Cross released on April 20, 2012. She's a projectile-based character who attacks with cats, crystals, and beams and can use different attacks for each crystal floating around her that she allows to generate. Additionally, she can perform double jump, as well as air dash, and she is the only character that perform a meta declaration while airborne. Her ability, "MetaBoost", boosts the duration of the player character's meta-world declaration and increases the meta-gauge's refill speed. ↑ コンプエース 2011年12月号 [Comp Ace December 2011 issue] (in Japanese). Kadokawa Shoten. Archived from the original on December 11, 2011. Retrieved December 11, 2011. ↑ "Ōgon Musōkyoku on Wikipedia". Archived from the original on 4 August 2016. ↑ 黄金夢想曲／アップデートパッチ (in Japanese). Alchemist. Retrieved July 18, 2011. ↑ Ryukishi07 (August 3, 2011). マスターアップしました (in Japanese). 07th Expansion. Retrieved January 1, 2012. ↑ 5.0 5.1 5.2 "黄金夢想曲†CROSS" (in Japanese). 07th Expansion. Retrieved April 20, 2012. This page was last edited on 21 February 2018, at 22:09.